Facebook users can now control their digital afterlives. The social media giant unveiled a new tool Thursday that lets users decide what happens to their Facebook accounts after they die — a living will for their social media profiles. New settings now let users decide whether their profiles should be deleted outright. 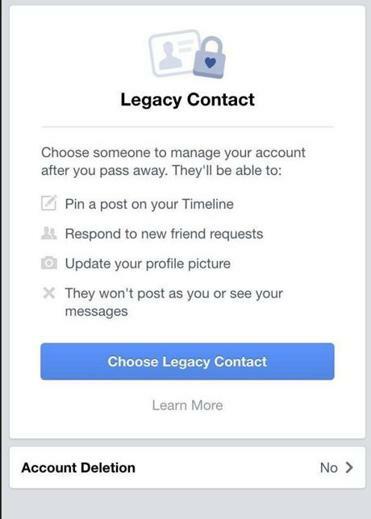 Or they can appoint a “legacy contact,” a kind of Internet executor who can manage their online presence. Until recently, the status of a Facebook page after the user’s death has been murky at best. Family members of the deceased were able to reach out to the social network and ask to have a page taken down or turned into a memorial. “I’ve had clients contact me saying, ‘As parents, we were hoping that the page of our deceased child would remain memorialized, but another family member contacted Facebook and said please delete that account,’” said James Lamm, a lawyer at the Minneapolis firm of Gray, Plant, and Mooty, who writes on the topic of digital estate planning on his blog, Digital Passing. Under the new protocols, a user’s legacy contact will be able to update a memorial page — including posting a prepared message from the deceased — download the person’s photos and posts, and publish updates at the top of the page. However Facebook will not allow the legacy contact to access private messages sent between users. Facebook’s new policy follows the lead of Internet search titan Google Inc. In 2013, Google launched its Inactive Account Manager service, which lets friends or family members take control of a deceased person’s Google assets. Google users can decide who will get access and which files will be available. For instance, a woman might let her husband download all the pictures stored in her Google Photos account, but block access to the e-mail messages in her Gmail account. Facebook’s new policy may be a reaction to efforts by a commission of legislators from various states to adopt a law that makes it easier for the next of kin to access a deceased person’s digital files. Delaware has already passed such legislation, and Massachusetts is considering it. But the legislation is opposed by Facebook and other Internet companies because it would give the deceased person’s relatives total access to his or her files. For example, the next of kin would be able to view e-mails that could contain embarrassing information about the deceased and his or her friends. It could also impact the privacy of the people who were in contact with the deceased — revealing identities, for instance, of members of Alcoholics Anonymous who exchange e-mails. NetChoice — a lobbying organization whose members include Facebook, Google, and Yahoo — supports alternative legislation that would block access to a deceased person’s online files unless the executor of his estate shows that the information is needed to settle his financial affairs or unless the deceased had granted permission to view the files. Such permission could be included in the person’s will, or the person could use a service like Facebook’s new legacy feature or Google’s Inactive Account Manager to express his desires. “While this is a great first step, I still encourage my clients to deal with this properly in their will or estate plan,” Lamm said. The legacy contact designation is part of Facebook’s compassion research initiative, which draws on the work of researchers, engineers, scientists, and psychologists to create a social media environment sensitive to the needs of its users. Facebook has also tweaked its settings to remove deceased users from their “People You May Know” links and birthday calendars. And on memorial pages, Facebook now adds the word “remembering” next to the name of the deceased. “It’s so simple but so powerful,” said Jed Brubaker, a doctoral candidate in the department of Informatics at the University of California Irvine whose research into how death plays out on social networks informed Facebook’s decision.